How to buy transit tickets and ride public buses in Paris, France. ABOVE: A No.63 bus heads toward the Gare de Lyon. INSET BELOW: Line 69 runs from the Père Lachaise Cemetery to the Eiffel Tower. In a city where Métro stations are never more than 500 meters apart, buses may seem like an anachronism. Still, there are times when a bus line may be the shortest distance between two points in Paris, and some travelers would rather look out a bus window (assuming that they can find a seat) than feel cooped up in a subway tunnel. 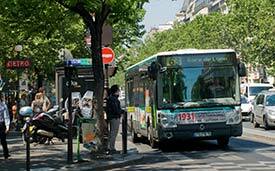 Paris transit buses are operated by RATP, the regional public-transportation network. Bus lines within the city have two-digit route numbers (such as 63 or 82), while suburban lines have three-digit numbers. You can obtain free bus maps from tourist offices and Métro stations, or you can download maps and apps from the RATP Web site. In this article, we'll tell you about fares and tickets, how to ride the buses, and where to find more Paris bus and transit information on the Web. To get started, click the link below. Inset photo copyright © Patrick Breig.